Samolepky s plastické fólie pro krytky kol (logo Empi GT) set 4ks. Etikety na bílém podkladě Ø 43 mm. Většina sportovních kol, je vybavena krytkou s uvedenou značkou, ale v mnoha případech není nic v nabídce. Pomocí jedné z těchto samolepek, se můžete rozhodnout pro správnou značku, nebo logo. Samozřejmě je nemusíte používat jen na kola. Naleznou široké uplatnění a vyznačují se vysokou přilnavostí. 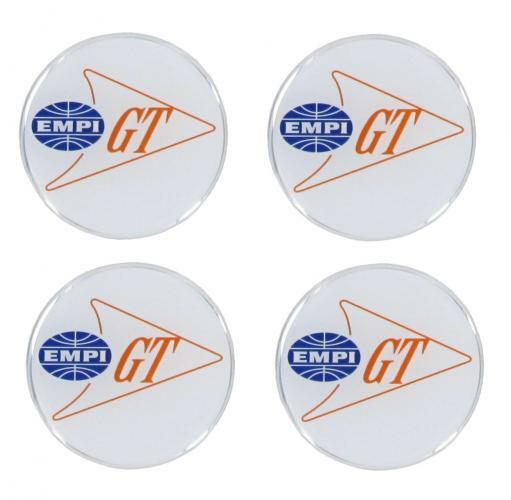 Wheel cap decals EMPI GT white Ø 43 mm 4pcs (foil stickers). Rim stickers, most sporty wheels are equipped with rim caps where sometimes the brand of the rim is shown but in many cases there is nothing on. With a brand rim drive around like most very misplaced and leave bare is not a decent option. Using one of these Rim stickers in the middle pasting, you decide with what brand or logo you around driving . There are two types of stickers available, a thick plastic making the logo more depth and can not defend and thin film which also on a non flat surface can be pasted. All plastic stickers with depth and EMPI GT + EMPI foil sticker (this is also transparent, leaving only the EMPI GT logo is visible) have a diameter of ± 45 mm and are per 4 pieces supplied. course not only be used on wheel caps, the strong adhesion everywhere discretion to stick.